In newly dug-up bulbs, the presence of a small hole in the base plate which is not easy to see. The bulb will still be firm as the larva is still quite small. In bulbs at planting time, a soft bulb which when cut open, will display a large grub in the centre of the now hollow bulb surrounded by a mass of frass (fly excreta). In the open ground, the non-emergence of bulbs in the following season, or a mass of “grass” like growth from the base plate which is not always completely destroyed by the grub. This “grass” like growth, will, if left a few years, develop into flowering bulbs again with normal lifting and replanting cultivation. There is now no chemical preventative or curative for this pest available to the amateur grower. HWT (Hot Water Treatment) will kill the grubs within the bulb but the damage has already been done. However, it may still be possible to save the bulb should it be a favourite or newly acquired expensive cultivar by cultivation as above. Should this pest be a particular problem in your local area then consideration should be given to covering the beds with either fleece or enviromesh to prevent the fly reaching the foliage to lay its eggs. It must be remembered that this will not be effective against flies that emerge from the ground when the cover is in place. 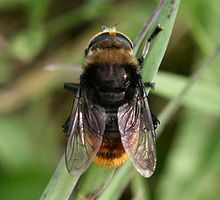 It is also worth noting that this fly also use snowdrops as a host plant and this may be the reason for localised troublesome populations. 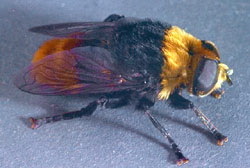 This is a much smaller fly which can produce two or three generations per year. It is said to only attack already damaged bulbs but this has been questioned recently. Damage to bulbs in the ground is usually restricted to a few bulbs but a much greater threat to bulbs in storage where significant damage can occur. Several small maggots are found in the bulb than the single one in the case of the large fly. Control is as for the large narcissus fly. This has become a serious problem with the culture of many house plants or orchids. It is a light coloured mite which is only just visible to the naked eye and is likely to found only on daffodils in storage above 17C (62F), where it attacks the top third of the bulb. It is killed by HWT and may controlled by an insecticide approved for that purpose. A much larger Mite than the above which has two dark spots and usually only attacks bulbs in storage which are already damaged by fungal infection. Control is achieved by good hygiene. An increasing problem for daffodil growers where although causing normally minor damage to the foliage they may also be a vector in the spread of virus disease from already infected plants. They can create serious damage, usually overnight, to the flowers. Control is by an appropriate molluscicide, both pellet and liquid forms, or by hand at regular inspections. A more recent and organic method is the use of a nematode which specifically targets slugs. 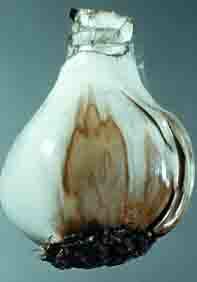 Early indications on effectiveness are promising in the reduction of keel slugs, which attack the bulb under ground. A relatively minor problem with daffodils caused by the caterpillars making holes in the outer scales of the bulbs. Control is by the removal of weeds and grass on which the moth lays its eggs. The most devastating pest of daffodils and most feared by growers. It is not visible to the naked eye and the first symptoms are “spickels”, small yellow raised and lumpy lesions on the edges of leaves or stems. It will usually be accompanied by large areas of the beds with weak growth, stunted plants, or even where no growth is seen. Bulbs cut across will show brown rings where the individual scales have been attacked by the nematodes, Infected plants should be destroyed and care taken not to transfer the infection on boots or clothing. There is no approved chemical treatment of eelworm in the ground and infected areas should not be reused for the growing of daffodils. HWT will kill the nematodes but this requires a high temperature, very careful temperature control and the use of approved chemicals within the solution. This is the most serious daffodil bulb disease which although it was described a hundred years ago as a serious threat, is growing in intensity as a result of hotter summers. The initial symptoms is the premature dying back of the foliage which when investigated, or at lifting time, reveals a soft or mummified bulb containing a chocolate brown rot spreading upwards from the base plate. At this point recovery of the bulb usually becomes impossible. The bulbs can become infected in storage or after planting and spores become widespread and are viable for over ten years in the soil. Control is very difficult even commercially. Resistant cultivars such as St Kevern are grown, but even these are not immune. The avoidance of fresh manure or excessive nitrogen is essential and the early lifting of the bulbs is preferred. These should immediately be sprayed with a suitable fungicide and dried rapidly in a good air-flow by using electric fans. Storage should then be at a low temperature of 17-18C (62-64F) with planting in late September or early October when soil temperatures are lower. Bulbs in storage should be inspected regularly and soft ones destroyed. Less common than basal rot but also a growing problem. As its name implies the disease spreads from the neck of the bulb towards the main body. There is more than one cause. Fusarium,(see basal rot), enicillium, and botrytis (see smoulder) are all implicated but usually separately. Control is as for basal rot and possibly any fungicide approved for this condition. This is less serious than the rots as above, but results in a lower bulb yield and unshowable flowers until the disease is eradicated. The symptoms are the appearance of a mass of grey spores as the leaves emerge from the bulb, causing the leaves to stick together. It is most likely to occur in cold, wet weather. The flowers are often spotted and the leaves can be polled away from the bulb revealing a grey mould at the base. It can also occur later in the season in cold conditions when it is less easy to spot. The primary infection usually occurs in the previous year so control is by HWT and foliar spray with an appropriate fungicide while the bulbs are in growth. Dead foliage should be removed from the beds that are left down for a second year. Another problem that was originally confined to the South West of the country, but which is now more widely spread. The symptoms are leaf tips that become reddish brown with a yellow border. The flowers may become spotted and there is usually premature die back. Control is by application of an appropriate foliar fungicide spray and HWT. 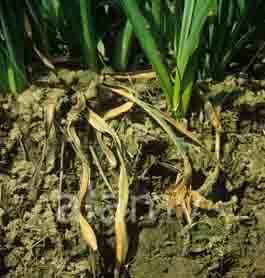 There are a large number of viral diseases that affects daffodils, the most common of which is yellow stripe virus. As its name suggests it is identified by yellow stripes on the green foliage which is more apparent as the foliage emerges and which often disappears as the season progresses. Other common viruses are cucumber mosaic virus, white streak virus and tobacco rattle virus. In some cases the flowers is also affected with “breaking” or light patches on the petals or dark streaks. In most cases even though the flowers are not affected there will be a loss of vigour and reduced yield in the plants involved. There are several vectors that transmit the various viral diseases including aphids above ground and nematodes and millipedes below ground. The spread of the disease may be slow or rapid throughout the collection but the only solution is to rigorously remove any obviously infected plants. It should be assumed that any very old cultivars are likely to be infected by viral diseases of this type and therefore it is probably wise to not grow them together with a modern collection. Some growers try to convince themselves the symptoms which they see are not viral but as a result of the plant being stressed. However, it is when the plant is stressed that the virus will normally be able to be most easily seen and it is safer to assume the worst rather than risk infecting the whole of one’s collection. Control is by destroying any infected bulbs and by controlling the agents that cause the spread of the disease by spraying regularly throughout the growing season to kill aphids and HWT for the control of nematodes.